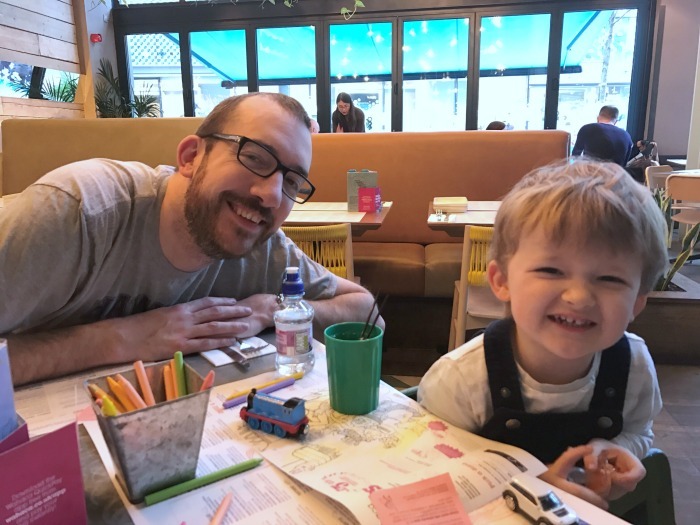 At Wahaca for Daddy's birthday last weekend - he was an angel! I know 28 months seems like a bit of a random number, and no I don't still count his age in months - I refer to him as 2 and a bit now. 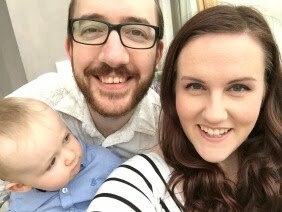 However, here in Wales at 27 months, all children have a review with the health visitor, which we had last month, so I thought I'd let you know how he's getting on. When we rocked up to the Drs we were greeted by a very bubbly health visitor. We were taken to a room where there was a bunch of toys in the corner that Squidge made a bee-line for and started playing with. She called him over to do some little tests. First up was stacking small wooden cubes - she'd started by stacking 5, then Squidge came and stacked the rest to 10 and put them away for her. Great. Next up was a wooden shape puzzle, he flew through it quickly like a pro - so she brought out a harder one, which he also completed. Next she produced a sheet of paper with blocks of colour on it, she handed him rectangles of colour and he had to put them on the right one, which he did (whoop!). Then there was a drawing game, getting him to draw a circle and a line, both of which he did with ease. She was really happy with him and how he's developing. However (there's always a however isn't there!? ), his speech isn't great. While he's got a good vocabulary and fantastic understanding - the words he says are really hard to understand. I used to be able to understand him great but now his speech is so broken we don't understand him half the time, and always have to interpret for other people. It's definitely gotten worse. We've always corrected words that haven't been said correctly - like if he says 'tao' (he means milk), we'll say 'yes, milk'. We try to work on his pronunciation too, but he gets annoyed and frustrated. He also has lots of books read to him, so I'm a little at a loss on how to help him. He tries so hard to repeat words, but often gets them completely wrong. The HV has given us until May, and if his speech doesn't improve by then he'll be referred to a speech therapist. Now this I can't quite believe. He's 2 years and 4 months old, and I'm already having to start buying him clothes for age 3-4!!! I really didn't think I'd be replacing his wardrobe so soon after changing it to his size 2-3 stuff. I'm trying not to buy too much as he'll be needing a summer wardrobe soon too! 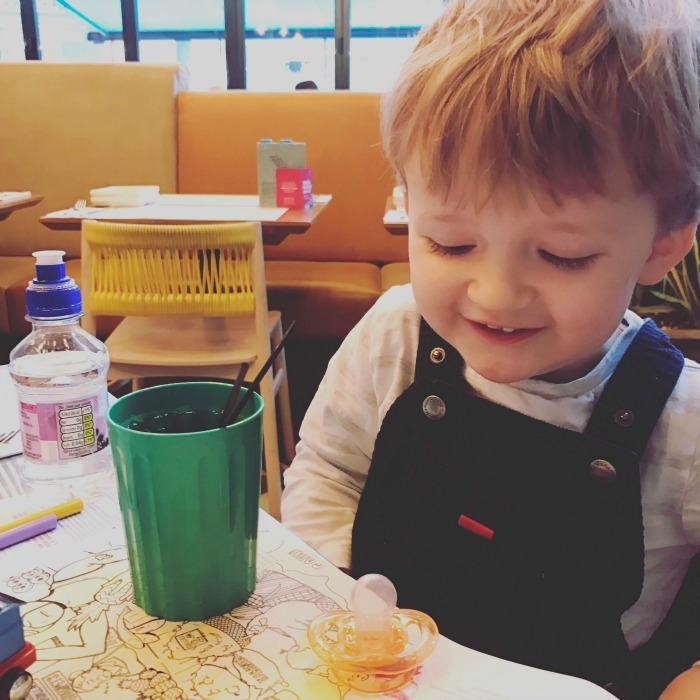 He's also growing out of his vests which makes me really sad, it was the last thing we were clinging onto of him being a baby... but they don't make them any bigger and all the short sleeved ones are getting too small. When we potty train him (probably April) he'll be out of them then anyway, just the end of an era - they grow up far too fast! He's learned to count to 10 which is great, and starting to learn to count his fingers, very cute! Although as his speech isn't great, most of the numbers begin with a 'd' - so one, doo, dee, dour, dive, dix, deven, eight, nine ten! (s's and f's he really struggles with). That sleeping face... I can't even. 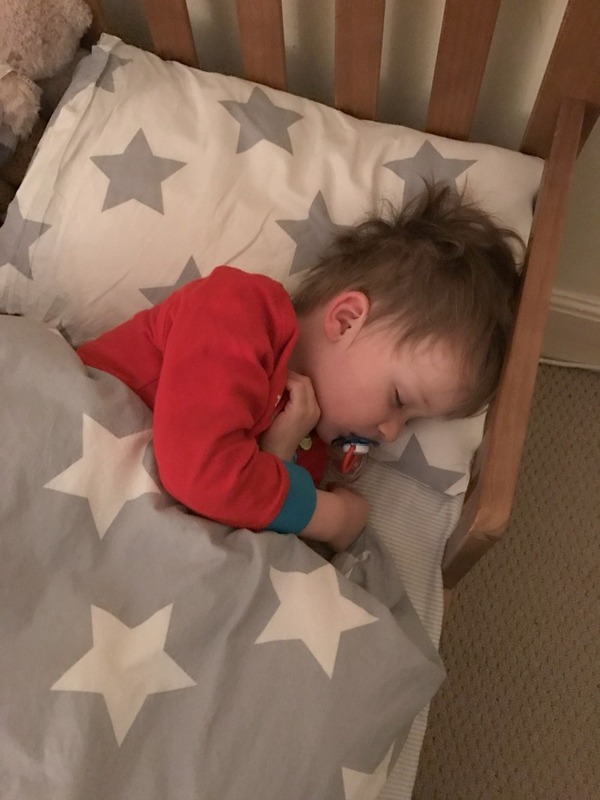 He's fully in a toddler bed now too - he's been in it since before Christmas, maybe Oct/Nov. There's partial barriers up on it at the top part by his pillow as part of the bed, but we don't have any other safety barriers on there. The ones I bought are too long by about 1/2 inch (frustrating!). However, we did surround his bed with pillows in case he fell out... which he did about 3 maybe 4 times, always fine. Then we realised it had been about 2 months since he fell out, so we took the pillows away a few weeks ago and he's been great! As it's a toddler bed it's very low to the ground anyway and his room is carpeted. He still has his bedtime bottle - 8oz of milk in a proper bottle, it's working for us for now so we don't plan on changing it. 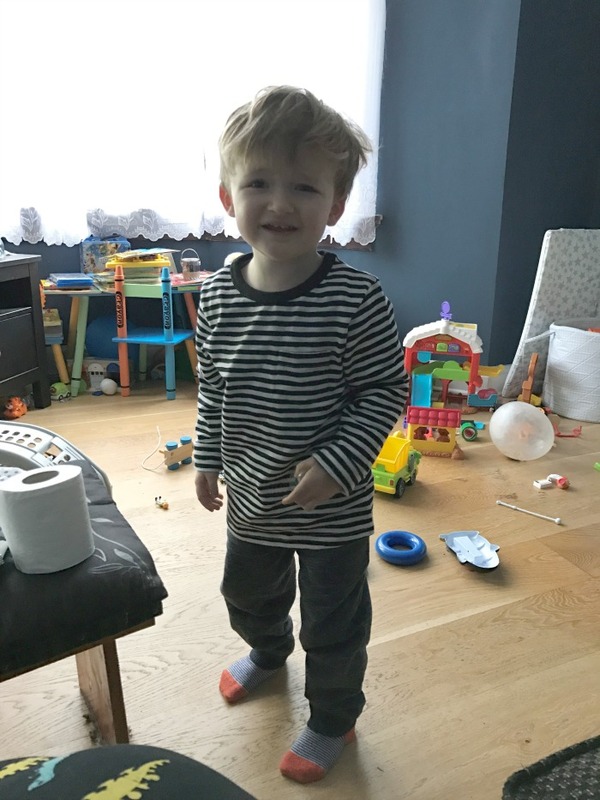 He brushes his teeth after it, watches either Twirlywoos and then 1 episode of Hey Duggee, or just 2 episodes of Hey Duggee and then off to bed. Speaking of sleep, that's a big change! He's in the process of dropping his day naps, so he may only nap in the day maybe twice a week now, he really resists it even when he glaringly needs it. Night times did get difficult too, he was taking ab out 2 hrs every night to get to sleep, but that seems to have eased up and only lasted a couple months. The current thing is waking up at like 6am on weekends instead of in the week when we have to wake him at 7, lol. Sometimes we're lucky though and he'll sleep in until 8am (rare but very treasured). I'm trying not think about how hard everything is going to get when Dot arrives in August, we'll just go with the flow at the time. But I do plan on them sharing a room once Dot is 6 months old - we really want to keep our 3rd bedroom as a guest room if we can.